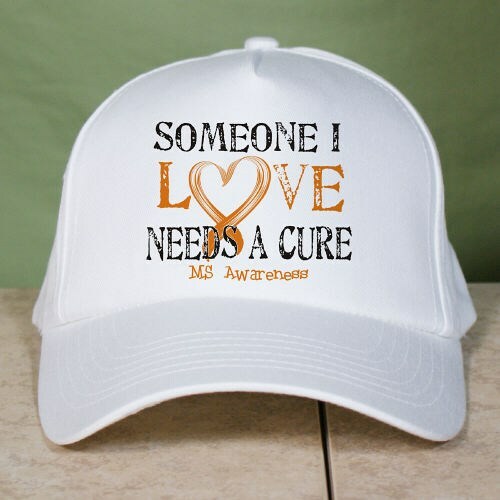 Support your loved one with this great Multiples Sclerosis Awareness Hat, whether it’s your Mother, Father, Sister, Brother, Friend or any loved one you know battling with MS. Our MS awareness gifts are a great way to spread awareness at any Multiple Sclerosis Walk Event. Our MS Awareness Hat is printed on our premium white cotton/poly Hat with adjustable back strap for a one size fits all. Today’s Price: $15.99 In Stock! Additional Info Multiple Sclerosis affects approximately 400,000 people in the US and an estimated 2.5 million worldwide. By showing awareness, you will help support MS and also help fund research for a cure. Wear this Personalized M.S. Team Walk Hat or our Personalized Needs a Cure Multiple Sclerosis T-Shirt at your next Multiple Sclerosis Walk Event. Be sure to also bring along our Personalized Needs a Cure Multiple Sclerosis Water Bottle to show your community who you are walking for. For all your Personalized Multiple Sclerosis Walk Apparel and Gear, shop MyWalkGear.com today.